The Adirmal Inn by the Falls Motel offers guests with a unique experience in Niagara Falls and one of the best accommodations in the area. This motel offers guests with wonderful hotel amenites and guestroom amenties to make your stay as enjoyable as possible. Some include free parking, free local calls from your room, free breakfast on weekdays, and an outdoor heated pool with a poolside lounge. A wide range of guestrooms are available at this motel, with standard rooms, honeymoon suites and spacious family rooms. All guestrooms feature a private 4-piece washroom, cable TV, refrigerator, coffee maker, and telephone for guest convenience. 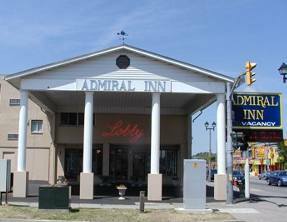 The Admiral Inn is famous for its location, a comfortable walk to the world famous Niagara Falls, Casino Niagara, The Skylon Tower, Maid of the Mist, and Imax Theatre. This Niagara Falls Motel is also known for its wonderful family friendly accommodations in the heart of the entertainment area of Niagara Falls, Ontario. The Adirmal Inn by the Falls Motel offers guests clean and comfortable rooms and great rates. Choose from a wide variety of wonderful guestrooms with 1 King Bed, 2 Queen Beds or Family Units with 3 beds. Guests looking for a romantic getaway are invited to relax in the Honeymoon suites with Heart shaped Jacuzzis and King Size Bed. All rooms feature a private 4-piece washroom, cable TV, refrigerator, coffee maker, and telephone with free local calls.